For a blazing, ignore all details, skip to the good stuff walk-through of how our service works, just watch the video above. For a bit more detail, read on. After you install our agent and tell it where you want your frames delivered, a systray/dock/finder icon will appear that contains a few simple menu items. The menu item you’ll use most is “Submit Job”, which will open a window similar to the one on the right. You fill in the necessary details for your job and click Submit. 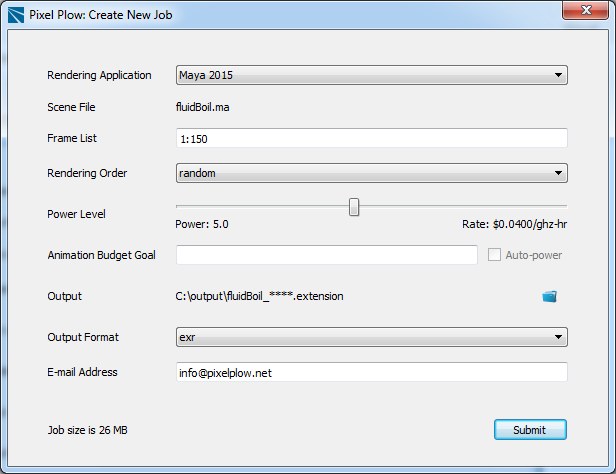 Render progress can be viewed in the job manager, as shown below. Completed frames will be delivered automatically to your workstation, and you’ll be sent an e-mail when the last frame has been delivered. For our detail-oriented customers, a more in-depth description of the render job submission process can be found here, or you can review information in our Support Portal.